Did Greenberg, Virginia Tech really snub MVP Curry during recruitment? Stephen Curry won the NBA MVP Award this year, leading even more people to wonder what former Virginia Tech head coach Seth Greenberg was thinking when he didn't offer him a scholarship. But there's a lot more to the story. Like Michael Jordan being cut from his high school varsity team or Russell Wilson being told by former NC State head coach Tom O’Brien that he was no longer wanted so Mike Glennon could take over, those aren’t the whole stories, but there are some elements of truth. In that same vein, beware of the legend of NBA MVP Stephen Curry and former Virginia Tech head coach Seth Greenberg. Curry’s father Dell was arguably the best player in Virginia Tech history, and he had a long NBA career too. He wanted his oldest son to go be a Hokie and his son wanted to be there too. But Virginia Tech wouldn’t offer him a scholarship. The initial reaction to that is, of course, "How could that possibly happen?" But that’s where that convenient benefit of hindsight pays off. This has been a legend that has only grown, and it began during Curry’s sophomore season at Davidson in 2008, when he carried the Wildcats to the Elite Eight, where they very nearly knocked off eventual national champ Kansas. He carried Davidson in the tournament, and the nation came to learn more about him, including that he had been second in the country in freshman scoring in 2007 — behind only Kevin Durant. Accusatory eyes turned to Blacksburg, where Greenberg was still the head coach at the time. His team had missed the NCAA tournament for the first of what would end up being four straight times, many of which were very close misses. But the previous season in 2007 — what would have been Curry’s freshman year — he got the Hokies to the tourney for the first time since 1996. So what exactly happened? Not just with Greenberg, but with the rest of the ACC, frankly — even schools like Duke and North Carolina in particular, who also missed on an in-state kid that would become a superstar? As usual, it’s never as simple as it seems on the surface. Curry has always been skinny — even now, his Golden State uniform often seems to hang loosely off of him — but he was even skinnier in high school, not to mention 5-foot-4 as a freshman at Charlotte Christian School. The school goes from kindergarten-12th grade, and has a total enrollment of just over 1,000 students. To call it ‘small’ would seem like an understatement. But the school is not invisible. Other great players came out of it, like NC State’s Todd Fuller. And while Curry was small, he grew, slowly but surely. He was 5-8 as a junior and right around 6-0′ as a senior — but barely 160 pounds soaking wet. Curry also didn’t play AAU basketball, a place where some of the more unheralded prospects often make a name for themselves. So the only thing schools offering him had to go on was his exceptional shooting stroke and the way he played against other small-school teams (which isn’t much). Davidson head coach Bob McKillop loved what he saw out of Curry, naturally, and Davidson was one of three schools to offer Curry a scholarship. The others were VCU (pre-Shaka Smart) and Winthrop. North Carolina, Duke, Kentucky, Kansas — you name it, the blue bloods in college basketball missed on Curry. But the conventional wisdom is that Greenberg’s Hokies could have easily taken a chance on a legacy-type player (the son of Dell), for bloodline reasons alone if nothing else. Curry told Yahoo! Sports recently it "sucked" not getting an offer from his father’s alma mater, saying that they offered him a "walk-on position", almost like a preferred walk-on. Obviously with Curry winning the MVP Award, more attention has been focused on this storyline. ESPN sports business analyst Darren Rovell tweeted that the player Virginia Tech signed "over" Curry, Nigel Munson, "left VT after his freshman season, averaging 3 pts, 1 assist per game". He included a headshot of Munson from 2007. Greenberg was fired in 2010 and is now an ESPN analyst. His daughter, Paige, got into a war of words with Rovell about the tweet, as did former NC State guard Julius Hodge, who seemed to think the tweet was an unnecessary shot at Munson himself. "Congrats to Steph Curry on his much deserved MVP award — an amazing player… to clarify some confusion on his recruitment at VT. We scouted him in high school and recognized his potential, but were didn’t have an available scholarship for him to play his freshman season due to several early commitments. We did offer him a 4 year scholarship with plans for him to red shirt his first year at school and laid the groundwork for him to play on scholarship the next four years with the team. His decision to attend Davidson and be coached by Bob McKillop turned out to be a great choice for his career." Curry would not have played much, if at all, as a freshman. The Hokies were led by senior guards Zabian Dowdell and Jamon Gordon, one of the best backcourts in the program’s history. Greenberg has been answering questions about this since 2008, and as ‘Charlottesville Daily Press’ columnist David Teel pointed out, he’s much feistier on the subject when speaking off the record. It’s understandable that it would be a source of frustration for him, and it only got worse when Curry’s younger brother Seth — similarly late-developing — didn’t get an offer from Greenberg (he went on to star at Liberty for one season before transferring to Duke in 2010). The younger Curry is in the NBA D-League now after graduating from Duke in 2013; missing on him is only an issue for Greenberg because of his miss on the older Curry. But it’s worth noting that the younger Curry wanted an offer before his senior year began, and he committed to Liberty before his older brother had even played a college game yet. Again, that whole issue of hindsight. Greenberg did try to pursue the younger Curry when he exploded onto the scene as one of the nation’s best scorers as a freshman and made it clear that he wanted to transfer, but by then it was too late. Not getting the Currys is hardly what got Greenberg fired. The argument has been made that the two should have been offered based on their family history alone, but Greenberg likely felt he couldn’t afford to take a chance on two undersized guards who had barely played any AAU basketball. It’s a success story of overcoming the odds, overcoming being doubted. We love those kinds of stories. And while there’s truth to it, Greenberg is the wrong villain — or, at the very least, he shouldn’t be the only villain. Even after everything he did at Davidson, he was still doubted. Minnesota had two picks in the 2009 NBA Draft — No. 5 and No. 6. They took two point guards. One was Ricky Rubio. The other was Jonny Flynn, who no longer plays in the NBA. 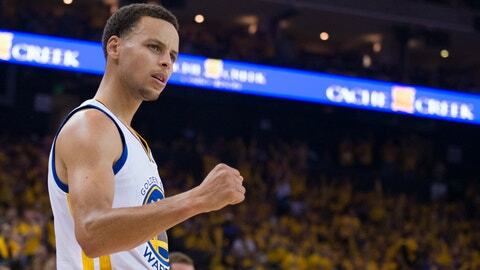 Curry was the fourth point guard selected at No. 9 overall, behind Rubio, Flynn and Tyreke Evans at No. 4. That would actually be a more legit beef, since obviously Curry had shown his size didn’t matter and that he could get his shot off against anyone on the college level. So NBA teams had more evidence to base their decisions on than did Greenberg back in 2006, and they still passed. Curry was much closer then to the Curry we see today than he was back then. It’s unfair to Greenberg, and perhaps to all coaches and decision-makers in sports who are the victim of hindsight. There are times when that’s a fair and real gripe. Maybe you could make the case that Greenberg should have done a favor for the two sons of a Virginia Tech legend. But that’s easy for you to say from the outside looking in, when your job could be on the line and if they failed, no one will care that you were just trying to do the right thing.